Understanding how extremely low-frequency (ELF, < 300 Hz) magnetic fields (MF) interact with human brain activity is an important question, especially regarding potential effects of power-lines MF (60 Hz in North America). Such knowledge is critical to 1) contribute to guidelines protecting public and workers from exposure to ELF MFs [1, 2]; and 2) design novel non-invasive brain stimulation techniques using ELF MFs to interfere with pathological brain activity patterns. We used an extensively validated neural mass model  describing the main neuronal populations forming a cortical column, which we extended by including 1) a time-dependent membrane potential perturbation caused by the induced electric field; 2) a model linking post-synaptic calcium concentration and synaptic plasticity processes . We used increasing levels of MF flux density at 60 Hz to identify the threshold for significant effects on simulated EEG alpha (8-12 Hz) power. 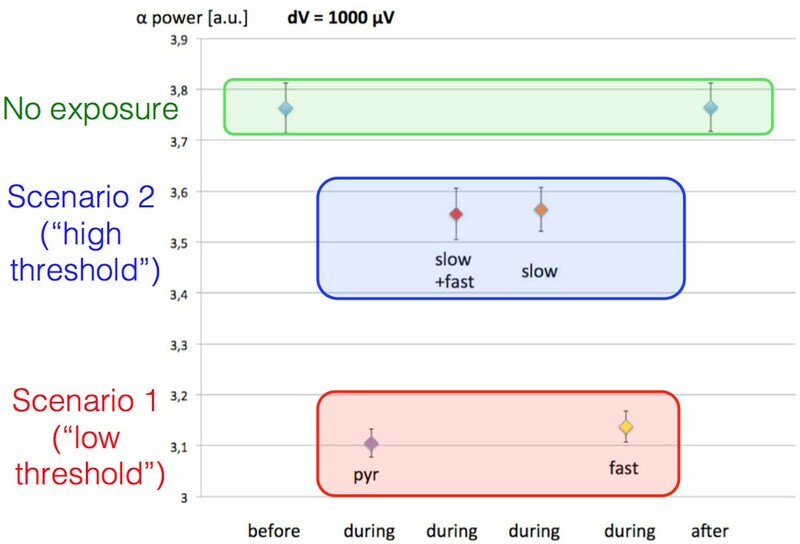 A 4x3x2 ANOVA for repeated measured measures was conducted on EEG alpha power before/during/after exposure, with/without 60 Hz MF exposure, with/without synaptic plasticity. Simulated EEG alpha power decreased with increased 60 Hz MF flux density (significant for 250<dV<500 μV when only pyramidal neurons were modulated), without significant effects from synaptic plasticity processes. If slow inhibitory interneurons  were also modulated, EEG alpha power decrease due to MF exposure was significantly diminished (see Figure). The model will be used to 1) understand human data currently acquired in our group ; and 2) study in silico effects of transcranial alternating current stimulation and magnetic stimulation (tACS/TMS). Future work will include frequency-dependent effects from extracellular medium dielectric properties, and selective modulation of specific neuronal populations. Lawson Health Research Institute, Mitacs Elevate Program, Hydro-Québec/Electricité de France/Réseau de Transport d'Electricité, and Canadian Institutes of Health Research.